Nice figs! Not a genre we covered very much. Is the bigifg oni 'shopped? Otherwise did you get a giant figure holding a sword with a bar handle? Really nice! I particularly like the Daimyo and the priest (?) to the left. Where do you get the pieces for their robes? Brickninja wrote: Nice figs! Not a genre we covered very much. Thanks! Most of my display collection is inspired by European history, mythology and fantasy. The Japanese-themed minifigs shown (and a bunch of ninjas that aren't shown) make up a very small part of my overall collection. Brickninja wrote: Is the bigifg oni 'shopped? Otherwise did you get a giant figure holding a sword with a bar handle? Not 'shopped. That's a genuine oversized figure. It's made by a company under licence from TLG. The sword is one of these in flat silver: http://www.bricklink.com/catalogItem.asp?P=98137. I had to wrap the handle to make it stay in the figure's hand. The figure isn't scaled to be compatible with the LEGO System. Maedhros wrote: Really nice! 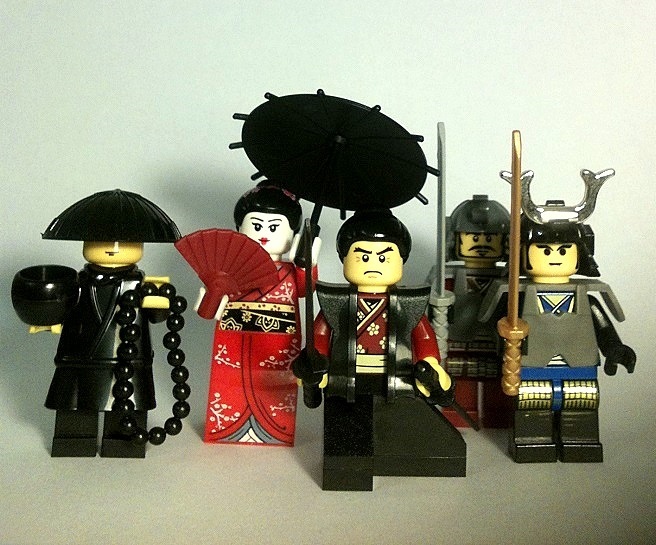 I particularly like the Daimyo and the priest (?) to the left. Where do you get the pieces for their robes? Thanks! The daimyo's jinbaori (surcoat) is by SI-DAN (as are some of the katana, the wakizashi, ninja-to, priest's hat, priest's accessories and geisha's parasol). 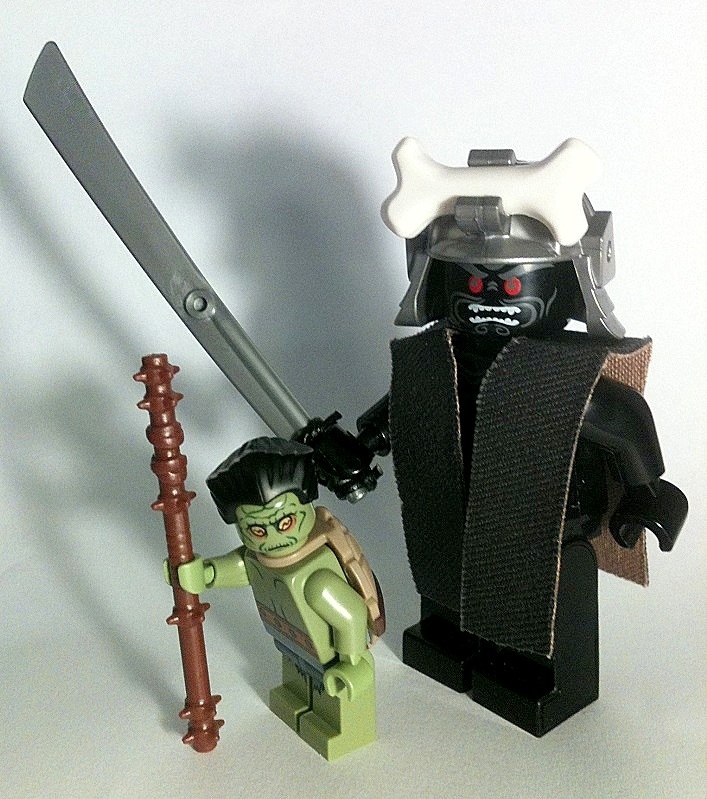 The priest's robes are by BrickTW and the kappa's staff is by BrickWarriors. 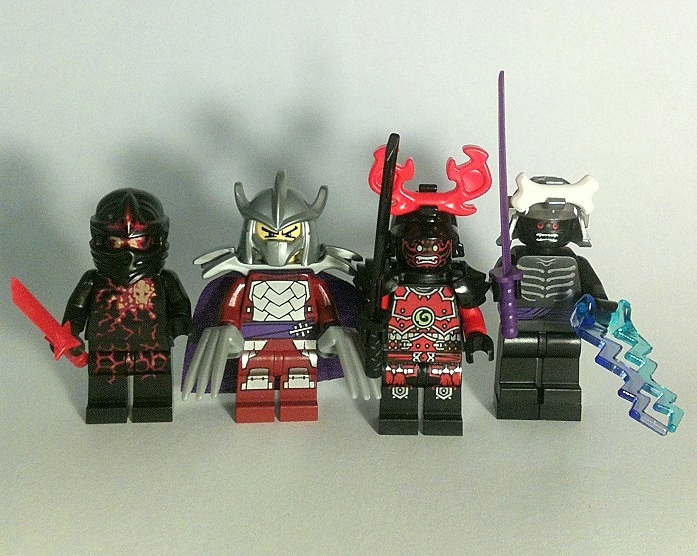 The armoured ninja's claws are by BrickForge. The bigfig's jinbaori is home-made as you probably guessed. The rest is LEGO. Did you ever see SW Samurai?